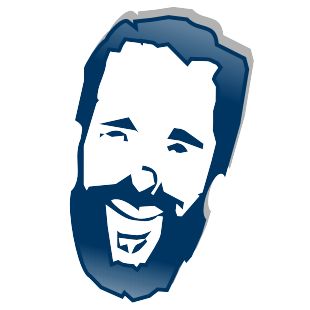 dErase is a tiny app designed for one purpose only, to delete files and/or directories with optional secure deletion routines. It can also fill a drive’s free space with garbage data in order to force-overwrite any “deleted” (yet still there) data on the disk. dErase can also be scripted. What makes the dErase files different from standard delete utilities, is that it will ignore file system ownership/permissions entirely while deleting, getting around access denied and similar errors that could come from deleting other user’s files, system files, or even malware related files. Alternately you may launch the program normally and browse for a file or directory using the buttons in the user interface. Finally, select your secure erase options and click the Erase button. Optionally you can choose 0 Secure Passes to just delete and not run any secure erase routines. Enter the partition drive letter and a colon under the “Erase File or Directory Tree:” option. 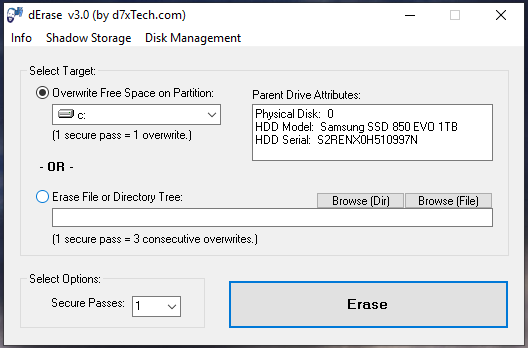 Select a drive, then select your secure erase options and click the Erase button. Select a drive, then select to “Delete All Shadow Copies …” from the “Shadow Storage” drop down menu at the top of the window. Includes shortcut to Disk Management (Windows MMC Snap-in) where you can delete partitions and/or format existing partitions/volumes. You may skip running secure deletion routines by specifying a zero for the number of passes, e.g. dErase.exe will temporarily install itself as a Windows service in order to run under the local system account, which has the ability to bypass file system ownership/permissions restrictions. Any attempt at deletion starts by renaming the file or directory with a random string of characters before deleting it, removing any file extension information in the process obscuring whether or not it is a file or directory, or a particular file type. When deleting directories, it does not delete the parent directory initially, rather it recursively loops through each subdirectory and renames/deletes each file separately, then renames/deletes the parent directory. This takes a good bit longer than just deleting the parent, but is more secure. Deletion attempts will remove all file system junction points matching the target object or within. Note that each single pass of the secure deletion routine on files and directories actually writes over the existing file with different patterns of data 3 times before deletion. This in itself makes the default single pass of the deletion pretty secure already! So in the example above of running 6 passes, you are actually writing over the file 18 times before deleting it. This is not the case with erasing entire partitions, which only writes over the partition once per pass. When dErase is run from a UNC path or mapped drive, it cannot install itself as a Windows service to run under the local system account (which does not have network access.) While these utilities will attempt to delete the target file/directory if possible, the attempt will be subject to file system ownership/permissions limitations and may fail if they are restricted from the current admin user. For this reason the utility will not function effectively in this environment from a network path/drive, and should always be used from a local drive when possible. dErase cannot delete files that are currently in-use. You cannot drag n’ drop multiple files or directory trees onto the dErase executable, it can only handle file or directory tree at a time. Due to the method used to delete files by first overwriting them (or overwriting free space) with zeros and other garbage data, you will see at times high CPU usage (single threaded) from dErase, in addition to extensive hard drive usage. Program Blocker is FREE for all personal and commercial usage.